BLACKFIRE Carnauba Spray Wax gives your vehicle the rich, reflective shine of Midnight Sun Ivory Carnauba Paste in an easy-to-use spray application. Refined and purified “Ivory” carnauba wax has been synthesized with BLACKFIRE's proprietary Wet Diamond polymers into a streak-free spray that is guaranteed to created whiplash! We didn't stop there, BLACKFIRE Carnauba Spray Wax is packed with nourishing oils and special anti-static agents that produce a rippling glow across the paint that stays cleaner, longer. Use BLACKFIRE Carnauba Spray Wax to boost your existing BLACKFIRE protection or as a stand alone paint protectant. It ripples with whiplash either way! BLACKFIRE Carnauba Spray Wax is the result of a lot of research and development. It is loaded with genuine “Ivory” carnauba in a completely VOC complaint formula. Special agents offer anti-static protection to your vehicle cleaner between details. Dirt and water slide of the paint in most cases. You will notice fewer water spots and less dirt accumulation. 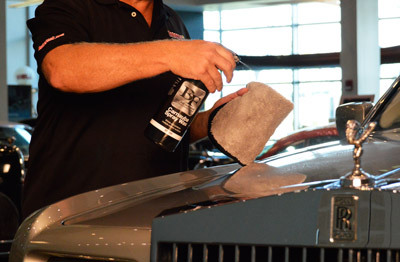 BLACKFIRE Carnauba Spray Wax delivers neck snapping results on all paint finishes and colors. It is unique premium grade carnauba wax that is perfect at maintaining concours automobiles and daily drivers. Directions: Shake can well. Wash and dry vehicle thoroughly. Spray BLACKFIRE Carnauba Spray Wax on to a section of paint and buff it off with a microfiber towel. Do not apply in direct sunlight to hot surfaces or on extremely cold days.